Welcome to Oasis RV Resort. 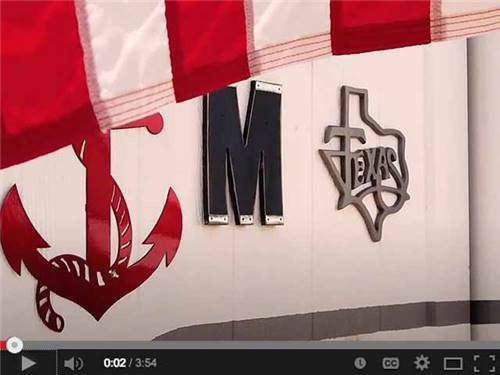 Amarillo's NEWEST, FINEST & LARGEST RV Resort. We are located in friendly Amarillo, Texas just off Interstate 40 at exit 60. A very quiet & secure location with easy on/off access to I-40. Would have given a higher overall, but the owner, I assume, over reacted to me carrying my dog into the office to ask a question. I thought he was going to have a heart attack. I said ok I am not bringing him in, you can calm down. That was the extent of any interaction with the staff. The facilities seem good, I used one of the laundry facilities and everything was in order. If staff was more pleasant I would have rated it a 5 overall. We since have stayed at another park in Amarillo and love it there. A one night stay en route home from Yellowstone NP. Best RV Park for miles around. Easy access pull throughs, sites are level and the whole park is very well maintained. Definitely will stay here again when passing through. As you leave I-40 and travel the park access road, however, the pot holes and damaged roadway require vigilance and SLOW speed. It seems to be the result of traffic entering and exiting the gas station at the intersection. Not the parks responsibility, just be aware as you enter/exit the RV park. Oasis RV is one of the best RV parks. The staff is friendly and helpful. The facility is modern & clean. Nice game room adjacent to the office. Burgers and pizza made on site are good. The bathrooms are always clean. Good laundry facilities. The park is clean, all concrete pads and roads paved. The pool area is well kept. Has an adult only hot tub area. Hookups 50 Amp - limited analog cable TV - good stable wifi. OTA TV was fine. Good location right off I-40 at Exit 60. Close to everything in Amarillo. This was our second visit in two years. Wonderful, wow, thank you! So glad we could be of service to you and that you have made our Oasis your go to spot when traveling through our area. We look forward in your return...Safe and happy travels. 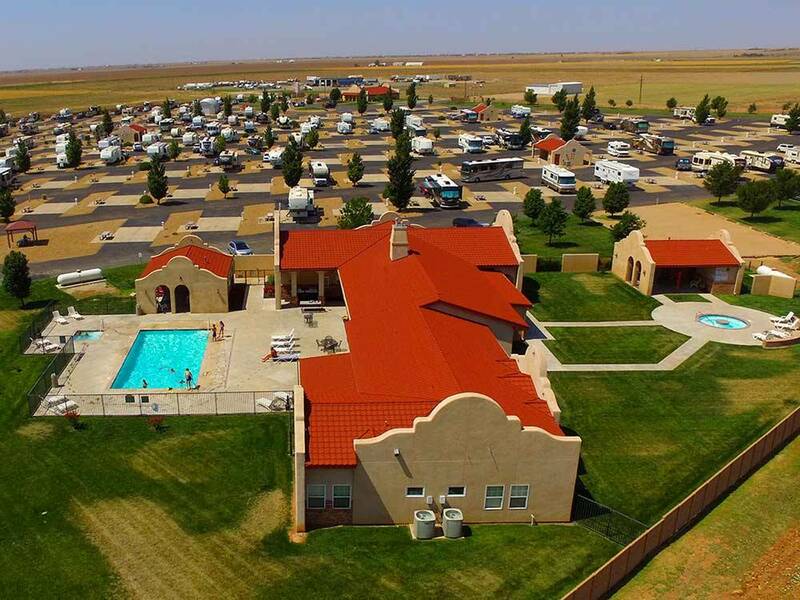 Outstanding RV Park, easy on off from I40 just west of Amarillo, TX. less than a half hour from Palo Duro Canyon & all of Amarillo's attractions. There is a lot to do with a water park, eateries, the Cadillac Ranch (ain't much), museums, etc. to keep you busy. (As of this review I40 is under construction but easy to get through on Sunday. Otherwise use the 335 loop). I wouldn't call Oasis a resort but they have a nice pool, recreation room with pool table, ping pong, cards, TV, etc. The park has very spacious sites with easy pull throughs for the largest of rigs with TOADs. Cable, water, sewer, 30/50 amp...you bet. There are no trees to speak of at Oasis, come to think of it I don't think there are any at all in the pan handle of TX, so shade is provided by your awning. However, it is very windy (20-25mph avg.) so I would keep the awning secured. The bath facilities were ea. private with shower & toilet, air conditioned & very clean. We stopped here twice going to & returning from Yellowstone for two nights each & enjoyed each stop. The staff were very friendly & accommodating. The staff go home at 6pm making a "late arrival" almost a certainty but with your reservation (recommended) you'll find posted next to the door a list with your name & site for the night...just pull in to the site, hook up & settle up in the morning. All-in-all I recommend Oasis RV Resort & would stop here again. This park merits the highest rating. Location is convenient to the highway and a truck stop, but far enough from both that there is no road noise. The staff are friendly and efficient. The facilities are pristine - concrete pads that almost require no leveling, ample space for big rigs to navigate and park and a beautiful pool and hot tub. We will definitely stay here again. We are honored that you wish to give our Oasis the highest merit, we are grateful, thank you. So glad you enjoyed our spot and will be back! : ) Looking forward in your return. Wishing you the best, take good care. Safe and happy travels. We are honored, thank you! Please come back to see us we would LOVE to see you again. Take good care, safe and happy travels. Very nice setup. Easy on and off of I40. We love the fact that the Texas Steakhouse has a free limo to the restaurant. My only negative is the wind. I guess this is north Texas. KL thank you so much! Wow, we are grateful for your review of our Oasis. We agree....it's a fun outing to the Texas Steakhouse and the free limo rides are great! And yes, the wind does blow here a lot but you're right....North Texas does get the wind! Please come back to see us we would love it! Safe and happy travels. Just a big parking lot! It was just an OK place to stop for the night! Would probably not stay here again if something else was available. We are very sorry to hear that our Oasis Resort was not a positive space you could rest in. This news saddens us because we only provide the best for our customers. We love pampering guests with our friendly service, and our amenities for relaxation and comfort. If something was dissatisfying we apologize and we hope that you will give us the opportunity to provide you with a better stay next time you are in the vicinity of Amarillo. Safe and happy travels, and thank you for taking the time to review us. We were overnight only but would have enjoyed more nights! The spaces are large and cement pads. Lots of grass for dogs. Friendly people all over the park. Yes, you can smell livestock but it's Texas and on the edge of town. Close to drive to stores or restaurants. The trees are growing but that's Mother Nature. The Park is very well maintained. Nice swing set for children and a good dog run for the pets. We are so thankful for you wonderful review of our Oasis! Well then, we look forward in your return, and hope you can stay additional nights to fully enjoy our hospitality : ) safe and happy travels. Extremely nice staff in a very clean & attractive RV park. Easy access for our 40 ft motorhome towing a Jeep. Large concrete level sites. Easy access to fill our propane tank. Highly recommend this park. Wonderful thank you! Easy access off of I-40 and providing large level spots for our fellow RVer's is something we have been working on for quite some time at our Oasis. When this is taken care of our guests can truly relax....We so appreciate you recommending us. Looking forward in your return. Safe and happy travels. We have stayed at several Good Sams rv resorts and this one was the Best of all of them. The sites are laid out perfectly, great staff and good pizza. Thank you very much! We love our pizza too, delivered with a smile : ). So appreciate your return business. See you next time! Safe and happy travels. Very new and clean. Nice pool and clubhouse to use. Cement pads which we liked. Great! Thank you! We are glad you enjoyed our Oasis. Looking forward in your return. Safe and happy travels. Large level, easy in and out sites. Limo service to and from Big Texas Steak House right from site. No trees but there aren't many anywhere around this part of Texas. Would stay here again. Thank you so much for staying with us. So glad you took advantage of the Limo service from Big Texas Steakhouse. It is a nice treat after a long days ride. Yes you are right, not many trees in our area and our young trees need a bit more time to grow, forgive the inconvenience. Looking forward to seeing you on your next trip to our Oasis. Safe and happy travels. Very nice RV resort. Large and well maintained. The reviews here are dead on. We had no problem with the pool being closed and really appreciated the thought that they had an adult Jacuzzi in a separate area. If you are travelling through Amarillo, we would highly recommend this resort. We love hearing that our reviews were dead on! Thank you from the bottom of our hearts. It is truly a pleasure serving you. Looking forward in your return. Take good care, safe and happy travels. Very clean park and the people were very nice to find me a space with me just passing through on my way back home in NC. Very nice pool area. We are grateful for you, thank you. We hope you will come back and spend more time with us. Take good care, and safe and happy travels. Sadly no trees here, but facilities are really nice, sites flat, and right off highway, this is only a layover type for our needs, but was worth it. Thank you for stopping in our Oasis! So glad we were worth it. Please forgive our small trees, they just need some time to grow. We hope to see you again on your next trip through Amarillo. Safe and happy travels. We are from the Ozarks so when we pulled up and saw basically no shade, we were worried! However, this campground is very nice. The pool, hot tub, and grilling area was great for all of us - we have 3 kids. Restrooms/showers are private and very clean. Sites are level. People are friendly. We really enjoyed our one night stay here. So glad we were able to wipe off those worries! We are grateful you gave us a chance and enjoyed our Oasis! Thank you! The trees we planted for shade are still small and just need time to grow, please accept our apologizes. Please come back to visit us we would love to see you again. Safe and happy travels. Only stayed 2 nights, but, these are the roomiest sites I have ever seen, The staff were very friendly. The camp ground itself is very well laid out, set back from the freeway so noise was minimal. The camp roads are all paved with large concrete pads, enabling even the biggest rigs to have plenty of room. (The slot next to us had a 45 ft Foretravel with Jeep toad and had plenty of room). A nice bark park is nestled away in one corner with a long grassed area down the fence line. We have already booked to stay here on our way home. Wonderful! Thank you so much for staying at our Oasis. We are so fortunate to have you, and that you will return to see us! Please let us know if you need anything. Have a fun day, take good care, safe and happy travels. This is a great place, especially if you have a big rig. We came in with a 45' motor home, towing a 26' trailer. They had pull through spots that are exceptionally long and fully paved, wide streets so turns are easy. Staff is very friendly and accommodating. We came a day early and they were able to get us in. Park is very clean, don't know about the bathroom and laundry, as we are fully contained, but just looking at the rest of park, they must be clean. Easy off I-40, and didn't hear any road noise. We will definitely stay here again. Thank you very much, we are honored you chose our Oasis to rest and relax. So happy we could accommodate your needs. We are glad you will stay with us again, what beautiful music to our ears! Take good care, safe and happy travels. One of the nicest parks we've stayed in. My bride complained of the feedlot smell, but I couldn't smell it. Large, level concrete pads. Asphalt paved streets. Large grass area for pets. Wi-Fi and cable worked good. First we would like to congratulate you on your marriage, we only wish you two the best. We are so fortunate you stopping in our Oasis. Thank you for your kind words about our park. We do our best to help our guests enjoy their time with us. Please stop in again, we would love to see you! Safe and happy travels. Most of the other reviews have covered everything correctly about this park. The pluses are the level, paved sites, large spaces, easy access. The minuses are the smell (a feedlot?) and the incredible wind. We stayed one night in a travel trailer. The utility hookup locations were not designed to accommodate travel trailers; the sewer hookup is far too forward of the electrical and water, so we had to pull forward after disconnecting in order to dump. Didn't use the clubhouse so can't comment on it. As stated above, the restrooms are designed to be storm shelters and therefore are not the sleek, modern facilities you'll find in other resorts. We would stay again if traveling through, although I wouldn't consider this a destination resort. Thank you very much for staying with us and giving us your feedback. The weather in our area can be rough this time of year, but it is the nature of the Texas panhandle, our apologies. Forgive the inconvenience with our sewer hookup, it is a work in progress. Our bathroom storm shelters give us peace of mind that we all will be safe in case of an emergency. We do our best to make them as clean and comfortable as possible. And we are always looking to improve, thank you again for your comments. So glad you would consider stopping in again to visit our Oasis. Best wishes for a safe and beautiful journey. Take good care. Great RV Park. One of, if not the best laid out park I've ever been to. The owners knew what they were doing when they put this park together. Close enough to activities yet far enough from town to make life very enjoyable. Excellent facilities and well maintained. Highly recommend. Wow, thank you very much for your lovely words about our Oasis! We appreciate you recommending us and much gratitude to you. Please come back to visit us soon, we would love to see you. Wishing you the best. Take good care, safe and happy travels. This was our second time at Oasis RV Resort and again we really enjoyed it. We were in town for business, so we don't look for "resort" amenities, but enjoy the cleanliness and friendliness of the park. The sites are big enough, and very clean and well maintained. The staff is very friendly and helpful. It is very conveniently located to I40 and pretty much anywhere in Amarillo. We will definitely stay here again if we're in the area. Price reflects weekly rate. We appreciate your return business, thank you! So glad we could provide you with what you needed. Looking forward in seeing you again on your next journey. Take good care, safe and happy travels. Very clean and inviting compared to the surrounding area (desolate farmland). Friendly staff and VERY CLEAN facilities. Thank you for your kind words about our Oasis. We are so happy we could help you feel at home. Looking forward in seeing you again. Safe travels, take good care. We stayed 3 nights to see some attractions in the area. The park is a short drive from I-40 (Exit 60: Arnot Rd) along a narrow 2 lane paved road that was showing some age near the gas station just off the interstate. The interior roads and sites are paved with concrete parking pads. The roads were wide and the turns were easily negotiated by larger RV’s. The sites were a mixture of pull through’s (in the center) and back ins (along the outer edges). The P/T sites were long enough to stay connected to toads. They have full hook ups – water, electricity (50 AMP), & sewer. The connections were generally near the middle of the parking pad. The sewer connection was at the ground so it was easy to establish a downhill flow. Sites had sufficient room for opening slides. Distance and gravel areas establish privacy between the sites. There was a nice outside table but no fire pit as open flame fires were prohibited. There were no obstructions to the sky so satellite reception was good. Park information sheet showed there were 38 cable channels and 5 broadcast channels. The park provided WiFi was adequate. It was password protected. Our Verizon WiFi hotspot worked well. Didn’t try the NET10 phone so don’t know about cell phone reception. There was a designated fenced pet area as well as there being sufficient distance along the park’s roads to exercise a dog. There were bag dispensers and collection stations for waste at the pet area and throughout the park as well as dumpsters scattered around the park. While being in a hazardous/severe weather area, they claimed to have storm shelters but didn’t see an underground storm shelter or any structure identified as a severe weather shelter. We would probably stay here again if visiting the area. There is another RV park a short distance away that has an underground sever storm shelter. TIP: Be aware there is a source of manure nearby so the odor can get strong at times. There was an on site pizza service. Don’t know if they delivered. We made day trips to a couple of National Park Service sites and Palo Duro Canyon State Park during our stay. Thank you very much for your review of our park. We work hard to provide the best in RV travel and we truly enjoy what we do. Your safety is our priority, our bathrooms were specifically built to serve as storm shelters we have 20 in all. Very happy you will come and see us again, we look forward to it. Palo Duro State Park is a beautiful spot so glad you were able to explore the site. Safe and happy travels. We did not use the facilities so unable to rate. Clean, quiet friendly park. Cement pads are great and there is more than average space between sites. Would stay again. Thank you for your 5-star rating and review of our Oasis. We hope you can indulge on our amenities upon your return. We would love to pamper you! Take good care, safe and happy travels. We stayed here for four days in our motor home. The facility is large, and near the interstate, but noise was a minimum. The sites are level, the restrooms are exceptionally clean, and we enjoyed the hot tub! We were disappointed that the pool was not heated, and therefore closed, but enjoyed our stay. We had a large pull-through site with ample room for the rental car. Thank you so much! We are so glad you enjoyed our spot, it was a pleasure serving you. Please come back and stay with us anytime, would love to see you again. Safe and happy travels. Stayed for two nights . One of the best parks in Texas..Park was well maintained and staff was very friendly and helpful. All paved roads with concrete pads..As close to a "dust free"park as you will find. It will be the park I use when traveling through this area. Thank you very much! What a wonderful review of our Oasis. So pleased you enjoyed our place. We are very happy we will see you again. Safe and happy travels. Nice people! Gave us some great recommendations for local attractions. Clean, big paved sites, good wifi. I would recommend this park & stay again when in the area. Thank you so much! We love our guests, and truly enjoy being of service. So appreciate you recommending us, and taking the time to review us. We look forward in seeing you on your next visit to our Oasis. Take good care, safe and happy travels. A great park to stay at. We stayed for a week, and were very pleased! All of the interior roads were paved and the parking pads were concrete and level. There is very little shade available, partly because it is a newer park, and partly because of the West Texas wind. There is a lot of space between sites, so no feeling of crowding or lack of privacy. There were several restroom and laundry facilities throughout the park. Very quiet even with the number of people coming and going every day. One of the best things about this park is the swimming pool! It was large enough to actually swim laps in! The only down side that we encountered in the park was that many dog owners do not pick up after their dogs, so the grassy areas and dog run were less than enjoyable. Thank you so much! It makes us very happy that we could be of service to you and your family. We agree, the pool is very refreshing. Please forgive the dog park not being its best for our furry ones, this is important and thank you for mentioning it. We appreciate your business, please stop in again if your are ever in our area. Take good care, safe and happy travels. Pretty park, easy to access off I40. It has a fully enclosed dog park that is clean and maintained. Very nice landscape. If you have ever seen Amarillo, you know how spartan that can be. The only drawback to this park is at night the odor of a distant feed lot is a bit overwhelming, but it can't be smelled during the daytime. We would stay again. Thank you for your 5-star review! That Texas air freshener can be overwhelming but only at times, forgive the inconvenience. Having a clean and friendly facility is important to us so all may relax and enjoy our Oasis. So pleased you will be back again and we look forward in seeing you soon. Safe and happy travels. Large RV park just west of Amarillo on I-40, near the Cadillac Ranch. Easy on/off from highway - good overnight stop. Good WIFI/cable. Paved roads and pads, mostly pull-throughs. Well maintained facilities. Pool was not open during our visit, but looked nice. Not all sites had picnic tables, none had fire rings. 45 minute drive to Palo Dura canyon. Shopping and services nearby. Friendly and helpful management. Park itself not very scenic though. This has to be the windiest places on earth! We were there 3 days and we could not sit outside at all. Everything in our site blew all over the place, the pool wasn't open, there is no grass at the campsite either. Our visit was okay, but not great. It's like camping in a giant parking lot located in a wind tunnel! The showers are nice. The laundry room is very small. Fourth night into our cross country trip and absolutely love this rv park. Easy to access and sites are paved, nice and wide with all of the things you want for an overnight stay. Would absolutely recommend this park if in the Amarillo area. Staff was very friendly and professional. Stayed in a 45 ft. motorhome. Very clean and level park with concrete pads. Not many trees. Excellent choice for overnight stay ... easy in/out with no obstructions on corners. Very clean showers/baths. Good wifi. Far enough from interstate to be quiet. 10 minutes or less to dining/shopping. Great spot for an overnight stay. Very nice staff and super easy access to space. Nice level concrete pad and perfect placement of utilities. Even the dumpster was an easy walk. I can not say enough about this park. Easy access from I40 and far enough from freeway that noise is not an issue. Stay here and you will not be disappointed. I plan on stopping here everytime I am in the area. Very nice park, pretty landscaping, nice staff. Only drawbacks: noise from I-40, little shade, and smell from nearby livestock. Still my first choice in Amarillo area. Thank you very much Archie 18. 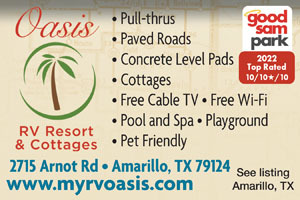 We are so pleased that you choose our Oasis when you are in Amarillo. We appreciate your feedback as we are constantly upgrading our place, so that we can bring the best to you. You are a valued customer and we thank you for taking the time to write us. Take good care. Safe and happy travels. We love this park. We stayed on the way to Colorado and coming home. Not so crowded as some parks. Friendly staff and very nice facilities. Thank you very much WoodyMiki, we are glad we could accommodate you. Hope to see you again on your next journey though our neighborhood. Take good care and safe and happy travels. Park is Very clean. No highway noise. Sites are paved. Everything we need is there. Thank you AATeam! So happy you enjoyed our quiet and friendly place. Please stop in again, take good care, happy travels. Very friendly staff. Large well maintained spaces. Plenty of room with all slides out. Clean grounds and enjoyed staying here. Far enough from freeway to not hear traffic, but still very close with easy access. Looking forward to returning! Thank you very much. Glad we could be of service. Hope to see you again on your next trip. Safe travels. Great easy off/on I-40 location just west of Amarillo,TX. The campground has clean and well maintained all concrete "drive thru" level pads. Love Truck Stop at east bound exit just before campground and good for refueling. Thank you so much for stopping in. We appreciate you business and hope to see you again. Take good care and safe travels.